For those without riding experience, please see our Junior Beginner Course. The Lancer Junior Membership program is for riders between the ages of 8 and 18 who have previous riding experience. The program term is 11 months (September - July) in duration and riders participate in two scheduled lessons per week. Class sizes are limited to eight riders. All instructors are NCCP qualified, first aid certified, and experienced riders and horse people. Our youngest riders will be able to walk, trot, and canter independently. Lancers is not only unique due to its location in the centre of Halifax but because of our longstanding and well defined approach to riding, horse care, community, and altruistic values. To learn more about our approach, click here. We are very proud of the strong and supportive Lancer community which is comprised of members, their families, alumni, and friends. We pride ourselves on the fact that our members feel that the stables are “home” and are a safe space for them to learn and grow both as equestrians and people. A significant part of the Lancer spirit is helping those around you and contributing to your community. As a not-for-profit, we depend on volunteerism within our community and there are many ways that riders and their families can become involved in their community and volunteer. In turn, being “a Lancer” brings a great deal of pride. To read more about our perspective on and expectations for volunteerism, click here. We are deeply committed to making the equestrian sport accessible. The Lucy Cuthbertson Memorial Fund provides financial support to junior members in need. Click here to learn more. Riding at Lancers is about more than just lessons! In addition to riding lessons, Lancers prides itself on offering a host of extra-curricular activities (many of which low or no additional costs). Such activities further shapes Lancers as a unique riding school and bonds together our strong community. Click on any of the photos below to learn more! As riders become more experienced they are eligible to join The Musical Ride which is made up of sixteen horses and riders. The riders are chosen from the upper junior rides and practice in the summer. 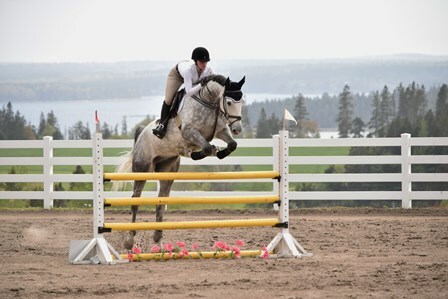 Junior Lancers compete at shows around the province in both the hunters and jumpers. The Lancer Junior Executive resembles a Students’ Council. The Junior Executive plans and facilitates fundraisers, social events, and community acts of goodwill. All junior members are invited to participate. Four times a year, we host on-property training shows for riders to practice their skills, gain show experience, and have fun! Lancers follows the Equine Canada Rider Level testing system. Riders which tests rider skills at ten levels. All lessons at Lancers are taught using the progressive guidelines of the EC Rider Level Program. We greatly value mentorship, learning, and self improvement and therefore, support riders who wish to train to become Equestrain Canada and NCCP qualified instructors. Junior riders are automatically members of our Lancers branch of the Canadian Pony Club and compete in various competitions and games. Once Junior riders have the option to lease a Lancer horse and will join the 3x program and enjoy a non-lesson Sunday ride each week. We are proud to provide many junior riders with what are often their first paid employment opportunities. Barn monitors are crucial for the running of our safe and educational lesson program and stablehands work on weekends and holidays. Lancers hosts a number of special clinics for our riders throughout the year which often focus on jumping, dressage, and groundwork. Our “sleep away” rural camp at Salmon River is always a highlight of the year. Junior members enjoy caring for the horses, trail rides, lessons, and cross country courses. The horses always equally love their holiday in the country. We believe that the more time spent around horses, the more we learn. We welcome junior riders to “hang out” in the stables, help others, and enjoy the horses. Riders can always be asked to lend a hand and muck in to chores and tasks! Throughout the year, sometimes a space in our membership becomes available. Spaces may open in advanced riders or more beginner-intermediate rides. We welcome inquiries and if we do not currently have a space available, we will add you to our waitlist. Please note: all riders who become junior members have completed Lancers junior beginner course or have some riding experience. To enter our youngest rides, junior riders in membership must be able to walk, trot, and canter unaided. Limited riding experience from camp or trail rides do not meet this requirement. For more on how to join our membership and for information on how our waitlist works, click here. The Lucy Cuthbertson Memorial Fund provides financial support to Lancers in need. Closed-toe, hard-soled boots with a small heel. Paddock boots or tall boots are acceptable. Neutral coloured riding pants that are comfortable, stretchy but sturdy (no jeans). Good leggings are a great alternative to breeches! Each horse has their own set of brushes so grooming equipment is not necessary but many riders like to have their own for shows or special occasions.